Slip hazards can include wet or dry contaminants on the floor such as water, dirt, or oil. Trip hazards can include open file drawers, boxes on a stairwell, or trash left on the floor. Falling from an elevated position can include into an open service pit, from a loading dock, tractor steps, or off a ladder. Slips, trips, and falls can occur when using equipment improperly. Slipping on a mechanic’s roller seat in the shop, tripping over an extension cord, or falling off a ladder with a damaged rung are common hazards. Talking or texting on a device, talking to a coworker, or eating and drinking while walking all divert your attention away from where you step and potential hazards in your path. Ignoring hazard signs and wearing improper footwear are other risky behaviors. Keep your attention focused on the task at hand and put away mobile devices, food, and drinks until you arrive at your destination. If a co-worker needs to talk, stop and have the conversation or table it until later. Hurrying is a common factor in slips, trips, and falls. Slow down and take shorter steps to ensure your feet keep their grip on the walking surface. Be cautious when working from elevated positions. Always maintain three points of contact (two hands/one foot or two feet/one hand) with a ladder, tractor steps, etc. The soles of your footwear act in very similar ways as the tires on your vehicle. Footwear with slippery soles can cause you to slip like bald tires can cause hydroplaning. 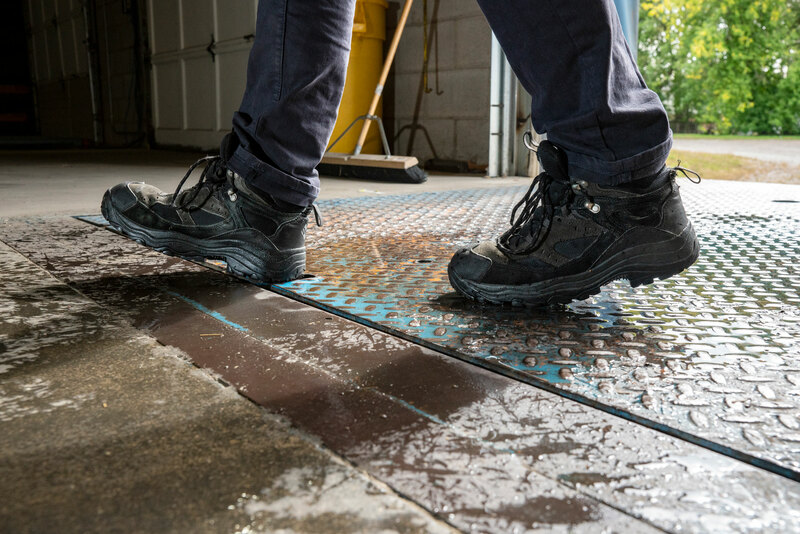 To prevent slips and falls, wear footwear with slip-resistant soles that are appropriate to the task and environment in which you will be working. Be mindful of trip and fall hazards like an open service pit or loading dock, equipment lying around, or hazards in walkways. Likewise, watch out for contaminants on the floor like a spilled drink in the break room, water on the restroom floor, or a freshly waxed floor. Do not ignore hazard warning signs. These signs are used to protect you and others from harm. Make a wise decision and find a path around the hazard area as instructed.